A tea bag (or "teabag") is generally agreed to be a small, porous bag used to steep tea. These bags may be sealed and filled with tea leaves or they may be open and empty (thus allowing the tea brewer/drinker to fill it with whole-leaf tea). Many tea bags have a string attached to make removing them from the brewing vessel easier, however, this is not true for all tea bags. Generally, tea bags with a string attached also bear the name of their producer or the type of tea on a small piece of paper at the opposite end of the string from the tea bag itself. The origin of the tea bag is steeped in legend. Around the turn of the 20th century, a tea importer named Thomas Sullivan is said to have stumbled upon the invention of the tea bag quite by accident. Story has it that he, like so many other tea importers of the time, had a habit of shipping samples of his latest imports to potential buyers. At the time, tea was highly prized and very expensive by today's standards, so the usual container for these samples was a metal tin. Sullivan decided to cut costs one year, sending his samples out in hand-sewn silk muslin bags (which resembled little sacks) instead of the pricier tea tins. Many of Sullivan's customers saw this newfangled packaging and thought it was an infusion method rather than just packaging. They dropped the bags directly into the water and were thrilled with the ease and simplicity of brewing and of cleaning up afterward. These customers placed unusually large orders, leaving Sullivan even more thrilled than they had been. However, when they received their orders, they were crestfallen. Where were the bags they had loved so much? They wrote to Sullivan and he realized what he had happened upon. He began producing more and more of these new "tea bags," as did others of the time. Sullivan failed to patent his invention, probably because he was late in the game. His customers received tea bags from him, but patent office records show that others submitted patents beginning in 1903! Regardless, it was his commercial (albeit accidental) use of tea bags that began their spread around the world and resulted in their enormous popularity today. At the time when Sullivan popularized the tea bag, many tea bag producers began experimenting with different materials for his tea bags, such as cheesecloth, gauze, cellophane and perforated paper. Paper fiber won out as the preferred tea bag material of the day. Hand-sewn bags were replaced by machine-sewn ones. Later, William Hermanson (one of the founders of Technical Papers Corporation of Boston) invented heat-sealed paper tea bags and sold his patent to the Salada Tea Company in 1930. In 1944, the typical shape of the tea bag was revised from the 'sack' style of bag to the currently common rectangular style of tea bag. In 1952, Lipton Tea company patented the so-called "flo-thru" bag, which has four sides instead of two and which was intended for those who were brewing in mugs rather than small teacups. Like the pyramid bag, this style of tea bag encourages more water to flow through the tea leaves and produces a faster-infusing, stronger brew. Amidst heavy marketing, Tetley launched the round tea bag in 1992. It was more of a visual change than a functional one. The pyramid tea bag shape was invented by Brooke Bond (the parent company of the United Kingdom’s PG Tips, and a tea brand which remains popular in India today). It gives tea 50 percent more room to move than a flat tea bag does, encouraging better infusion, and is similarly suited for mugs and teapots rather than small cups. In recent years, so-called 'tea socks' have become popular amongst some full-leaf tea drinkers. These are not a tea bag in the true sense of the word but are large, tea-bag-like infusers which are made of similar materials and which are disposable. They can be filled with the leaves of your choice and then folded, clipped or tied shut for infusing, then removed and thrown away after the tea is brewed. Many tea connoisseurs take offense to the use of tea bags. The reasons are threefold. Firstly, tea bags restrict the amount of space that tea leaves have in which to unfurl during the steeping process. This means that whole-leaf teas will likely release only some of their flavor and nutrients into the cup or pot and that much of the nuance and benefit found in high-quality tea will be lost when it is steeped in a tea bag. The second reason tea connoisseurs often despise tea bags is borne out of the first reason. Early in the history of tea bags, their vendors quickly realized that their usual tea leaves couldn't fully expand in tea bags. So, they started to break or chop the leaves so that they would have more surface area exposed to water and to infuse more fully, despite the limited infusion space. This move toward more broken leaves eventually resulted in the use of many broken grades of tea and the development of CTC tea. These teas are (generally speaking) inferior to whole-leaf teas in all aspects but one--the ability to infuse quickly and fully in limited space. To be fair, there are three other areas in which these types of tea are 'better' than whole-leaf tea. They're cheaper. Pound per pound, they can produce more servings of tea IF you're only infusing the leaves once. If you're talking about a spice/herb/flower blend with a mix of dense and fluffy ingredients, it's easier to evenly mix and portion your tea with tea bags than it is with loose-leaf tea blends. The third reason most tea connoisseurs eschew tea bags is the standardization. Whereas tea bag producers often see standardization as the hallmark of quality, many tea connoisseurs see it as completely beside the point. You see, tea from a single origin and a particular season is like a vintage of fine wine. It is completely unique thanks to the one-of-a-kind weather conditions that produced it, and neither those particular circumstances nor that particular batch of tea will ever be repeated again. This incredible variety of tea flavors, aromas, appearances and body effects (i.e., the movement of qi it generates) is much of what tea lovers love about tea, so the idea of losing all that for standardization seems, well, crazy to your typical tea lover. In recent years, there has been somewhat of a trend toward filling various types of tea bags with 'specialty teas,' such as whole-leaf teas and exotically flavored blends. That said, the term 'specialty tea' has been expanded in the realm of tea bags, and is now often used to describe practically anything in a tea bag other than a highly standardized, blended black tea in a bag! So if you want the good stuff, it's best to think outside the tea bag, so to speak. Although any tea connoisseur will tell you that tea is far better when left to infuse freely (and when it's not made from the types of leaves used to fill the vast majority of tea bags out there), tea bags are enormously popular around much of the world. Statistics on the preference/use of tea bag show that tea bags are used by as many as 98% of Americans and 96% of UK residents. Furthermore, tea bags are widely used in India, Japan and elsewhere. Initially, tea bags were only popular in the United States, in part because they were invented in the U.S. and in part because Americans simply adore anything that saves them time and effort. (I say this as an American!) They were widely available in the U.S. by the 1920s and didn't spread to the U.K. until 1953 when Tetley Tea launched the first tea bag for the U.K. market. Tea bags are often said to make tea brewing and drinking extremely convenient and easy. All you need to make tea with a tea bag in hot water and a brewing vessel, usually a teapot or mug. After brewing to the desired strength, the tea bag can be removed and set aside. There have been many innovations in the shapes of tea bags over the years. 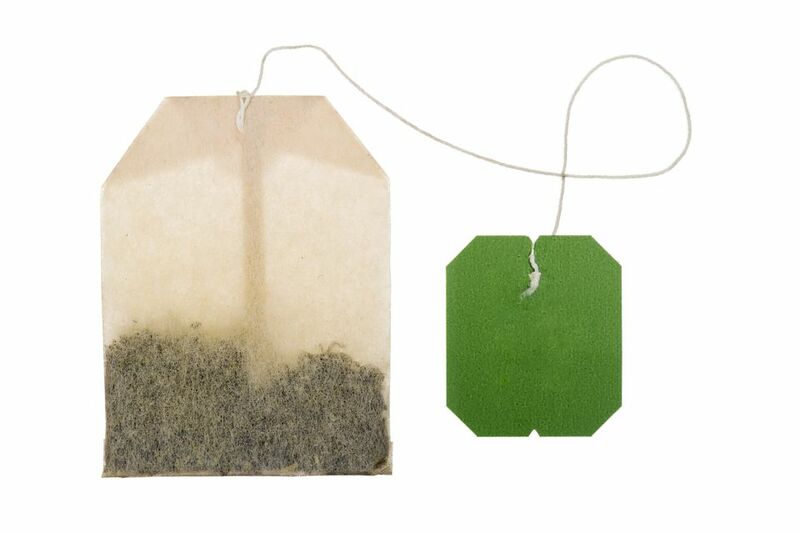 The earliest tea bags were sack-like in shape. Later, tea bags became flat and rectangular. In the 1950s, Lipton invented the multi-dimensional "Flo-Thru" tea bag, which gave leaves more room to open. And in the last few decades, round tea bags, pyramid tea bags and even stick-like tubes made from perforated foil have been added to the growing list of tea bag shapes out there. Now, there's even a perforated film in the shape of a stick that needs to be stirred for it to infuse (It's called Tstix). Tea bags are commonly made of filter paper, cotton muslin or "silken" food-grade plastic (such as nylon or PLA/Soilon). They may be sealed with glue, a staple or nothing (meaning that the tea bag is folded shut, sealed with heat or sealed with ultrasound). They often have a bleached or unbleached cotton string and a paper tag indicating the brand or type of tea contained within the bag. Filter paper tends to be the default tea bag material. Although it is bleached, it is relatively environmentally safe and non-toxic. Cotton muslin is a more specialty product. It is often unbleached, but it tends to impart a taste on the tea. Food-grade plastics (often marketed as "silken" tea bags) are made from various types of plastic. There are two benefits to these bags. One is that they are semi-transparent, so you can see the leaves, spices, flowers, etc. inside them. (In France, the pyramid versions of these bags are sometimes called "crystal" tea bags, because they shimmer and look a bit like transparent crystals). The other is that they are usually used to make pyramid-shaped tea bags, which infuse tea better than most other tea bag shapes (yet still not as well as loose-leaf tea infuses!). There are some downsides to silken tea bags. First off, they're plastic, which is a little bit of a wonky choice for something to put in the hot liquid you're about to drink. Second, the nylon bags are absolutely not biodegradable (unlike paper and cotton muslin). And, furthermore, the "corn-based" plastic tea bags are made from industrially produced, genetically modified corn that has been so heavily processed on its way to being a tea bag that it no longer contains any genes. Yikes! Furthermore, the claims that this kind of plastic is biodegradable are questionable, as they do not meet the FTC's marketing standards for biodegradability.